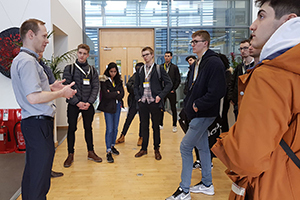 Recently SELA members had the opportunity to visit the University of Sheffield’s Advanced Manufacturing Research Centre (AMRC), a centre for world leading research into methods and technologies practical for industry. Due to the size and scope of the AMRC (and the time limitations) we were not able to see all there was to offer and were instead taken on a whirlwind tour of some of the facilities and ongoing research. 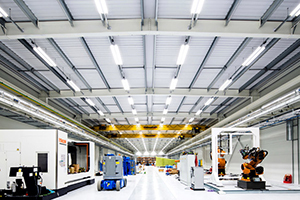 Factory of the Future focuses on research into machining methods and other manufacturing techniques, developing and trialling them before they are introduced into industrial factories. A difficulty when machining components is the instability that can occur when machining thin walls or other such structures. These areas can deform and result in inaccuracies in the finished product. A robotic arm can be used to apply opposite forces to the machining equipment in order to minimise this issue. Using techniques such as Blown Powder deposition, it is possible to build onto existing components, modifying them for specific tasks. These additive manufacturing techniques show great potential for repair and rapid manufacturing but are not currently understood well enough for production environments. Ongoing research into these methods hopes to bring them up to a viable standard for industrial usage. After Factory of the Future we moved to the Design and Prototyping Centre. It conceptualises and prototypes designs for a number of applications, including those in the medical field through the Medical AMRC. 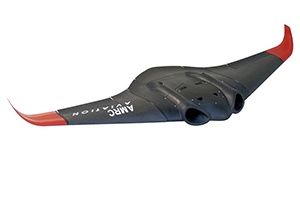 A fully-functional and powered UAV that makes extensive use of rapid manufacturing (RM) techniques such as Fused Deposition Modelling (3D printing). The goal of this project was to investigate the use of RM techniques when manufacturing designs of complex geometry. 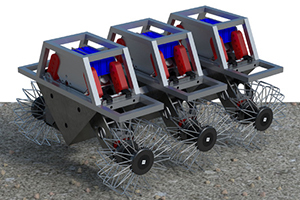 An unmanned ground vehicle (UGV) designed to withstand blasts from buried explosives, requiring the identification of design features that enhance survivability. The features identified through the design and testing of this model have the potential to be scaled up and incorporated into manned vehicles. We were shown a concept wheelchair that would allow its operator to be at level height with other non-wheelchair-bound people. This offered an interesting view into the iterative nature of the design process. There were three models, each more developed that the last, with the first using a modified office chair for the seat and the last having an entirely custom design, for example. 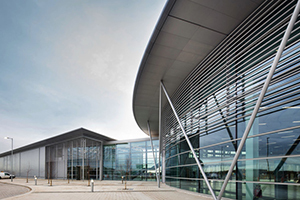 Finally, we moved to AMRC’s Factory 2050, which conducts research into robotics and automation, integrated large volume metrology, digitally assisted assembly, manufacturing informatics and other areas, offering a window to see how industries of the future may conduct the tasks of today. Driving these advances is one of the twenty-first century’s most valuable resources: data. Through use of data, researchers are able to garner information that can be used to optimise, assist in, and in some cases, automate, key processes in industry. Here we were shown the way in which old tools can be brought up to this new standard of the information era, retrofitting them with sensors to gather operational metrics that can be used to generate useful insights such as running costs and operational performance. We were shown a ‘part checker’ that uses machine learning to determine if the quality of a part is up to the requisite standard, surpassing human practitioners and effectively automating a position with a high-turnover rate (due to its repetitive nature), whilst achieving far better results. We learnt how the use of augmented reality can be used to increase productivity and reduce the time to complete set tasks. This was achieved through the digitalisation of instructions and the use of an augmented reality headset to ‘overlay’ key task information onto the item being worked on (we were shown it in the context of an electrical maintenance task). This visit was thoroughly interesting and gave us the chance to experience the innovation and progress that is made in state of the art research centres such as the AMRC.